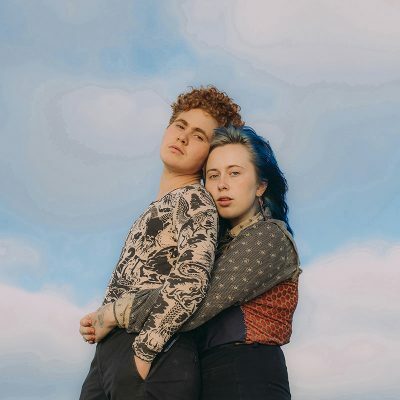 Girlpool’s fourth full-length album comes almost two years after their last release, 2017’s Powerplant. What Chaos Is Imaginary realizes the sound they were pushing for on Powerplant, and goes beyond it. While Powerplant affirmed that they’d never be the stripped down, guitars-and-harmonies duo they used to be—-What Chaos Is Imaginary shows just how much they’ve truly grown. While they were teens at the beginning of their career, they’re now adults with different lives. In the two years since Powerplant was released, Cleo Tucker has come out as trans, and Harmony Tividad has faced her own hardship with her mental health. Full of older songs written individually over the years, here Tucker and Tividad bring their pasts into focus, and into their warmth of their body of work. Individuality is maybe the most marked change from their old material. The two don’t sing together anymore, or at least not in the same way. Some tracks feature only the vocals of Tucker, whose use of hormone replacement therapy has deepened their voice. And Tividad sings alone too, her airy soprano sometimes accompanied by Tucker’s low murmur. They’ve invested in a sound that is softer and more reflective than their days of shouting in harmony. On the emotional opener, Tucker sings with a voice so full it’s like they’re grappling with a dare-not–to-cry. They sing, “I swear I’ll be alright although Emily’s in the sky/ She waters the ground with gin she pours me out.” The song, and it’s possible reference to their 2015 song, “Emily,” is too cryptic to shed any light on why Tucker’s voice is so heavy. Behind Tucker’s voice, the guitars rustle restlessly over one another, cementing the feeling that Tucker is mulling something over. sad lyrics that mark it as a very different song. She sings, “You live halfway / In a transient home / Off the highway / Didn’t mama tell you / There’s so much to see / There’s a silver lining / And a ripping seam.” As violins swell around her, and with Tucker’s voice murmering behind, Tividad sings about a “ticket to heaven,” painting a dusky scene that despite the violins veers away from romance, into a melancholic removal. It could capsize with emotion, but the measured drum machine and Tividad’s exacting delivery keep the song on track towards a different horizon.